From the time you arrive at the Bow Valley Grill and are met by the friendly staff, the sights and smells of this dining room heighten your sense of anticipation. 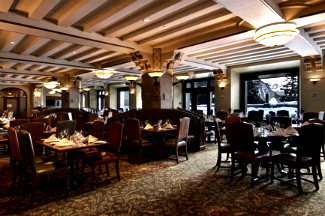 Located in the Banff Springs Hotel, this mountain grill offers a wide range of delectable dishes and imaginative desserts. Whether you like ordering from a menu or prefer checking out different dishes in a buffet, prepare to be wowed. In all my years of living here in the Rockies, I have never been disappointed. Known as the Castle in the Rockies, the Fairmont Banff Springs Hotel is surrounded by an impressive panorama with spectacular views of the Bow Valley and in the distance the Fairholme Range. To the right are the stunning views of Mount Rundle. From your table you will enjoy the wonderful atmosphere of the large dining room with its spectacular views. If you make a reservation in advance, you can always request a window table, but regardless of where you are sitting, you will enjoy a great dining experience. The dining room is open to the kitchen so you can watch the top-notch chefs as they prepare the meals and desserts for the patrons of the Bow Valley Grill. Every once in a while, a special friend or guest will come to visit, and we’ll make a reservation. Whether it's for an elegant dinner or their famous Sunday brunch, it is the prefect location to entertain. My personal favourite is the Sunday brunch. I would recommend that you try many of the entrée dishes that they have put out - take very small portions so that you can try many! The food is always fresh and well prepared. You can watch the chefs at work as you go through the buffet line which is just a couple feet from the kitchen. Chefs are also there to make you an omelette to order. Take advantage of the array of freshly baked bread and desserts. If you plan on visiting the Bow Valley Grill, you want to give yourself at least 2 hours. 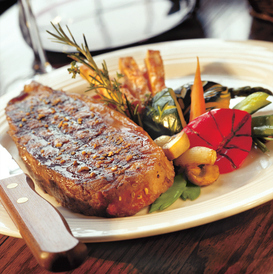 The selection is large - from their appetizers to their entrées all the way to their deserts. It truly is a feast. In addition to food, there's quite a selection of wines from all over the world to complement your meal. I have fond memories linked to this locale. On one special occasion, a friend of ours from Germany had come to visit. His name was Manfred - our children called him "Opa Manfred" since he was in his eighties. One of his favourite pastimes was going for a fine meal with a nice glass of wine. He treated us that evening to a wonderful dinner at the Bow Valley Grill – and it was our last outing in Banff together. He really had a passion for fine dining and we all enjoyed watching him take pleasure in a delicious meal with a good glass of wine as he told us his stories of his life. It is a memory I'll never forget. Now, if you're looking for a quieter and more intimate dining experience, there is the Grapes Wine Bar where my wife and I enjoyed an anniversary dinner together. To end the evening, we sipped on a late night drink at the Rundle Lounge. Saturday from 11:30 a.m. to 1:30 p.m.